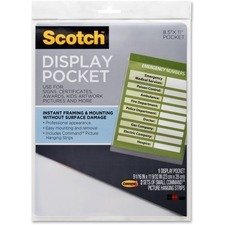 Display Pocket is great for instant framing and mounting of signs, certificates and digital prints. Rigid, clear plastic gives your documents clear visibility and a professional appearance. Display pocket includes Command removable interlocking fasteners for easy mounting and removal.